The pilot's injuries are not believed to be life-threatening, YCSO said. 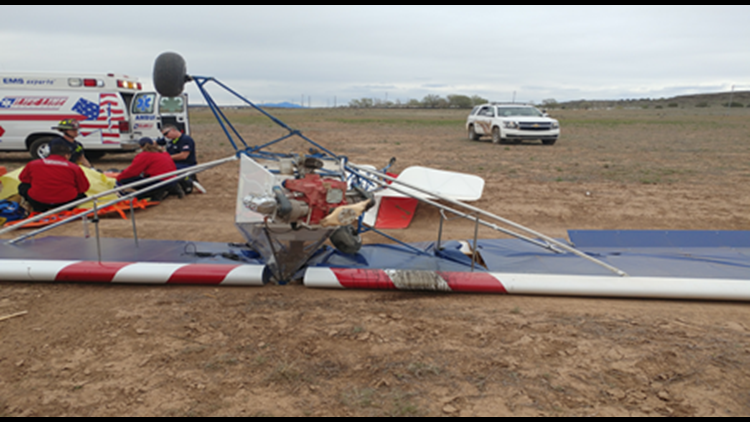 PAULDEN, Ariz. - A pilot of a homemade ultralight aircraft was airlifted to the hospital after the plane crashed west of Highway 89 in Paulden, the Yavapai County Sheriff's Office said. YCSO said they received a call from a driver on Highway 89, who reported seeing a small aircraft crash in an open field near the highway. Emergency responders found 51-year-old Kenneth Seebeck of Florida conscious, but with broken bones. He was the only person in the plane. Seebeck's injuries are not considered life-threatening, YCSO said. Seebeck's father, George Seebeck was at the scene as well and said he and his son built the aircraft. He said the plane went down within a minute of taking off. The cause of the crash is unknown at this time.